Our blog isn’t just about birthday parties. It’s a blog about fun events, and the 2017 Solar Eclipse is definitely going to be a fun one. Our staff is looking forward to it. Here’s 5 things that may help you with viewing the 2017 Solar Eclipse in Niagara. 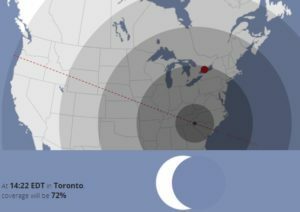 The 2017 Solar Eclipse is happening on August 21, 2017 and the path is crossing North America starting at approximately 1:20 PM EST from a Toronto Viewpoint with maximum coverage occurring at approximately 2:15 PM EST. 2. How much of the sun will be covered? From a Southern Ontario Standpoint, the most coverage of the sun we will see is about 72%. We aren’t getting a total eclipse. It’s a sad price to pay for being so far North. This doesn’t mean that it won’t be a great show. If you are looking to get the full (no pun intended) eclipse experience, you will either need to head to the North Western states or to one of the Southern or Central States. Check out this interactive eclipse map from the CBC to check it our for yourself. 3. What makes this eclipse special? This is the first solar eclipse visible in North America in almost a decade. Solar eclipses happen almost every year in different parts of the world, but because the shadow of the moon is so small on the Earth, only a few get to see them. Sometimes, eclipses happen in the middle of the ocean and are only visible while on a boat. The last solar eclipse to land in North America the Western Hemisphere was back in 2008, almost a decade ago. The last one visible in Canada was back on March 7, 1970. Luckily, there’s another one happening in April 08, 2024 whose path is passing directly over the Niagara Region. Marked it on your calendar. 4. How to view the eclipse? Didn’t your mom tell you not to stare at the sun? Well she’s right. Don’t do it! At least without wearing the proper gear. Sunglasses do not count. Staring at the sun for the duration or even a portion of the eclipse can and will probably do irreparable damage to your eyes. 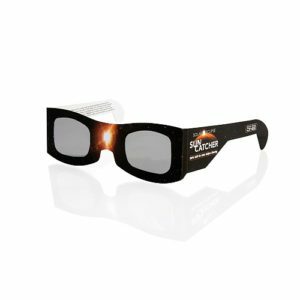 We found in-expensive eclipse glasses for under $4 a pair at Toys-R-Us. We suggest getting a pair of those to make sure you protect your eyes. 5. How else should I prepare for the eclipse? Let us know about your plans for watching the eclipse. Are you planning anything special for it? Have you seen one before? Let us know on Facebook and Twitter. If you want more fun news, subscribe below.